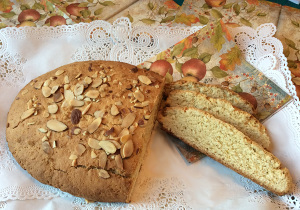 The ciambella romagnola is a very simple dessert typical of the Emilia-Romagna cuisine. Ciambella Romagnola is also called “brazadela” in the local dialect. 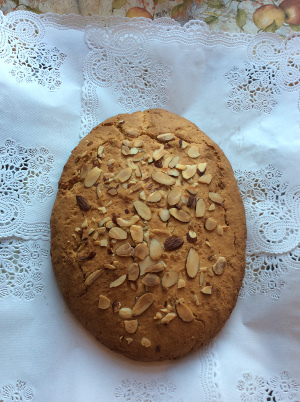 The classic shape of the ciambella romagnola is an oval, without a hole in the centre. Its texture is soft on the inside and crispy outside. As in the case of many traditional recipes, it is difficult to say which one is the “original”, because each family has its own version. 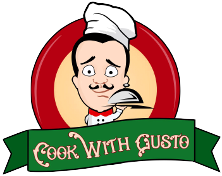 Today there are many variations of the recipe but the basic ingredients are similar – flour, sugar, oil, butter or lard, milk, and eggs. 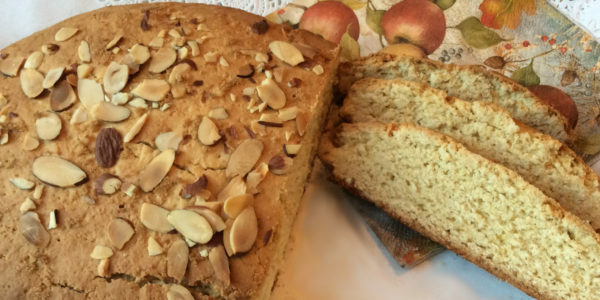 Our ciambella is healthier because it is prepared with extra virgin olive oil, brown sugar instead of white, and covered with thinly sliced almonds. Also, there is less sugar, thanks to a tip we got from an expert pastry chef from Romagna: add 1 tablespoon of high-quality apricot jam in place of 50 gm. of sugar. Another good thing about preparing ciambella is that it fills your home with a wonderful aroma. Extra virgin olive oil 100 gm. 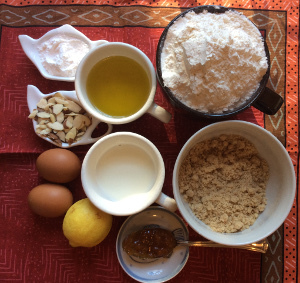 1 baking tray, 1 bowl, parchment paper, 1 fork, 1 spatula, 1 grater for zesting the lemon. 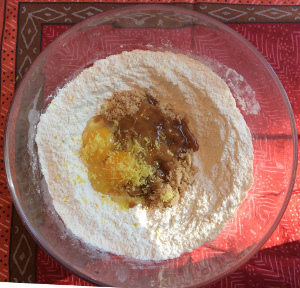 Put the flour and baking powder in a bowl, mix well and form a hole in the centre. Open the eggs and place them inside the well, together with the sugar, extra virgin olive oil, and lemon zest. With a fork, quickly work the eggs together with the other ingredients. 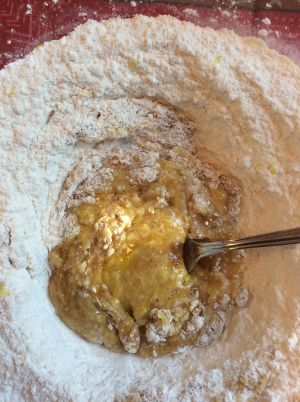 Add the apricot jam and milk, then start to include the flour from the sides. 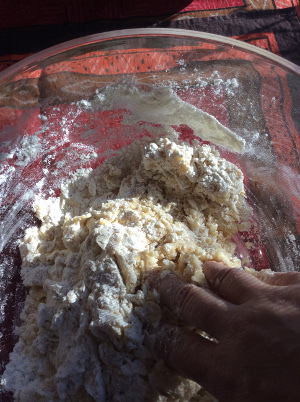 When the dough becomes thicker, start working it with your hands. Important: do not over-knead the dough. It should take about 2 minutes to mix it. 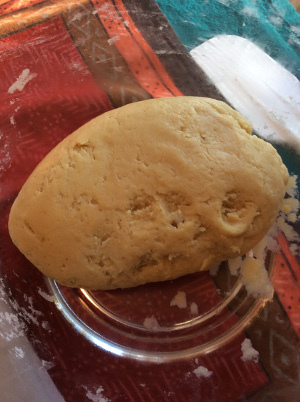 The dough you will get at this point will be stiff and you will be able to form a ball. 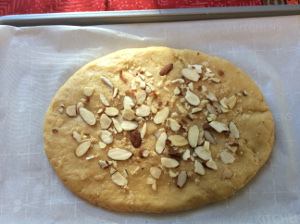 Line a pan with parchment paper and put the dough on the paper. 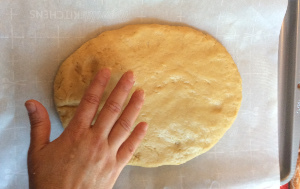 Using your hands or a spatula push the dough into an oval shape about 22 cm long and 12 cm wide. Sprinkle with brown sugar and almonds. Bake at 160° C in a static oven for about 40 minutes. Ecco! Your ciambella romagnola is ready! If you use a food processor you can put the ingredients together and work them until you get a homogeneous mixture. Be sure not to overmix. Butter or lard can be used instead of extra virgin olive oil. It is quite common to use half butter and half oil. White sugar can be used in place of brown sugar. Things you can add to the dough: some diced apples, chocolate chips, jam, or custard. You can sprinkle white sugar instead of brown sugar on top. 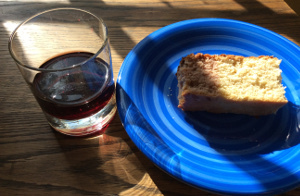 It is common to serve the ciambella with wine for dipping. The most popular wines are Cagnina, Albana, and Sangiovese di Romagna.